Definition at line 17 of file CQScreenshotOptionsDialog.h. Definition at line 22 of file CQScreenshotOptionsDialog.h. Definition at line 18 of file CQScreenshotOptionsDialog.cpp. References mCurrentHeight, mCurrentWidth, mCurrentX, mCurrentY, mDefaultColor, mHeight, mHighlightColor, mImageHeight, mImageWidth, mLastFrame, mLayoutHeight, mLayoutWidth, mLayoutX, mLayoutY, mWidth, mX, mY, slotDisplayButtonClicked(), slotDrawSelectionToggled(), slotFrameButtonClicked(), slotFramesTextEdited(), slotFramesTextEditingFinished(), slotHeightChanged(), slotImageHeightChanged(), slotImageWidthChanged(), slotWidthChanged(), slotXChanged(), and slotYChanged(). Definition at line 197 of file CQScreenshotOptionsDialog.cpp. Returns which frames are to be exported. For a dialog that does not display the frames option, this will return UNSET. For dialogs with the frame option, possible values are CURRENT_FRAME, ALL_FRAMES, USER_DEFINED_FRAMES. Definition at line 250 of file CQScreenshotOptionsDialog.cpp. Returns the set of frames. Definition at line 258 of file CQScreenshotOptionsDialog.cpp. Definition at line 166 of file CQScreenshotOptionsDialog.cpp. Referenced by CQLayoutMainWindow::saveImage(), and CQNewMainWindow::slotScreenshot(). Definition at line 182 of file CQScreenshotOptionsDialog.cpp. Definition at line 174 of file CQScreenshotOptionsDialog.cpp. Definition at line 158 of file CQScreenshotOptionsDialog.cpp. Definition at line 142 of file CQScreenshotOptionsDialog.cpp. Definition at line 150 of file CQScreenshotOptionsDialog.cpp. Definition at line 191 of file CQScreenshotOptionsDialog.cpp. Definition at line 203 of file CQScreenshotOptionsDialog.cpp. References mCurrentHeight, mCurrentWidth, mCurrentX, mCurrentY, mHeight, mLayoutHeight, mLayoutWidth, mLayoutX, mLayoutY, mWidth, mX, and mY. Definition at line 416 of file CQScreenshotOptionsDialog.cpp. Definition at line 264 of file CQScreenshotOptionsDialog.cpp. References ALL_FRAMES, CURRENT_FRAME, mFrameOption, and USER_DEFINED_FRAMES. Definition at line 422 of file CQScreenshotOptionsDialog.cpp. References mDefaultColor, mFramesEditHighlighted, and mHighlightColor. Definition at line 439 of file CQScreenshotOptionsDialog.cpp. Definition at line 373 of file CQScreenshotOptionsDialog.cpp. References mHeight, mWidth, and slotWidthChanged(). Referenced by CQScreenshotOptionsDialog(), and slotWidthChanged(). Definition at line 313 of file CQScreenshotOptionsDialog.cpp. References mImageHeight, mImageWidth, and slotImageWidthChanged(). Referenced by CQScreenshotOptionsDialog(), and slotImageWidthChanged(). Definition at line 284 of file CQScreenshotOptionsDialog.cpp. References mImageHeight, mImageWidth, and slotImageHeightChanged(). Referenced by CQScreenshotOptionsDialog(), and slotImageHeightChanged(). Definition at line 342 of file CQScreenshotOptionsDialog.cpp. References mHeight, mWidth, and slotHeightChanged(). Referenced by CQScreenshotOptionsDialog(), and slotHeightChanged(). Definition at line 404 of file CQScreenshotOptionsDialog.cpp. Definition at line 410 of file CQScreenshotOptionsDialog.cpp. Definition at line 48 of file CQScreenshotOptionsDialog.h. 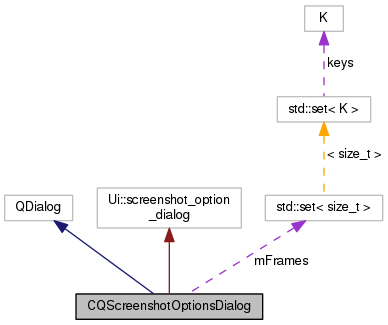 Referenced by CQScreenshotOptionsDialog(), and slotDisplayButtonClicked(). Definition at line 46 of file CQScreenshotOptionsDialog.h. Definition at line 42 of file CQScreenshotOptionsDialog.h. Definition at line 44 of file CQScreenshotOptionsDialog.h. Definition at line 73 of file CQScreenshotOptionsDialog.h. Referenced by CQScreenshotOptionsDialog(), and slotFramesTextEdited(). Definition at line 66 of file CQScreenshotOptionsDialog.h. Referenced by isSetDrawSelectionDecoration(), and slotDrawSelectionToggled(). Definition at line 51 of file CQScreenshotOptionsDialog.h. Referenced by getFrameOption(), and slotFrameButtonClicked(). Definition at line 54 of file CQScreenshotOptionsDialog.h. Referenced by getFrameSet(), and slotFramesTextEditingFinished(). Definition at line 75 of file CQScreenshotOptionsDialog.h. Definition at line 60 of file CQScreenshotOptionsDialog.h. Referenced by CQScreenshotOptionsDialog(), getHeight(), slotDisplayButtonClicked(), slotHeightChanged(), and slotWidthChanged(). Definition at line 74 of file CQScreenshotOptionsDialog.h. Definition at line 63 of file CQScreenshotOptionsDialog.h. Referenced by CQScreenshotOptionsDialog(), getImageHeight(), slotImageHeightChanged(), and slotImageWidthChanged(). Definition at line 62 of file CQScreenshotOptionsDialog.h. Referenced by CQScreenshotOptionsDialog(), getImageWidth(), slotImageHeightChanged(), and slotImageWidthChanged(). Definition at line 69 of file CQScreenshotOptionsDialog.h. Referenced by CQScreenshotOptionsDialog(), and slotFramesTextEditingFinished(). Definition at line 40 of file CQScreenshotOptionsDialog.h. Definition at line 38 of file CQScreenshotOptionsDialog.h. Definition at line 34 of file CQScreenshotOptionsDialog.h. Definition at line 36 of file CQScreenshotOptionsDialog.h. Definition at line 59 of file CQScreenshotOptionsDialog.h. Referenced by CQScreenshotOptionsDialog(), getWidth(), slotDisplayButtonClicked(), slotHeightChanged(), and slotWidthChanged(). Definition at line 57 of file CQScreenshotOptionsDialog.h. Referenced by CQScreenshotOptionsDialog(), getX(), slotDisplayButtonClicked(), and slotXChanged(). Definition at line 58 of file CQScreenshotOptionsDialog.h. Referenced by CQScreenshotOptionsDialog(), getY(), slotDisplayButtonClicked(), and slotYChanged().